In the last blog, I talked about how increasing global commodities prices might put pressure on government to lift the export ban in order to take advantage of international prices. We are seeing this pressure for cotton and sugar now a days. There is a meeting scheduled tomorrow, headed by Prime minister to sort out the issue. Let's take up cotton as an example. We are one of the top producers. 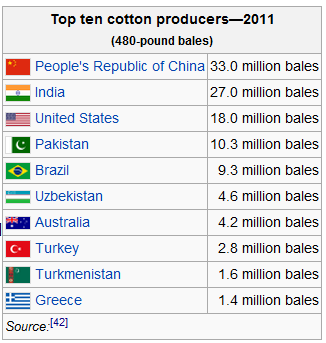 And second largest exporters of cotton in 2011, behind US. 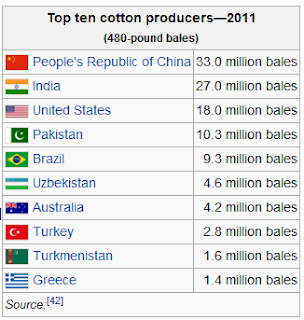 Interestingly, China absorbs all its domestic cotton in textile manufacturing. They even import from us and others. And China protested when we banned the cotton exports! Let's see the arguments. The textile industry, headed by the commerce minister Shri Anand Sharma, is batting to ban exports. They say, that the textile mills will not get enough cotton at low prices otherwise, and this would affect their profitability and existence. As textile industry is one of the biggest employment providers in India, it is difficult to ignore them (I consider the argument that mill owners are being fattened at farmers' expense as bogus). The agriculture minister, Mr Sharad Pawar, bats for farmers. He feels that the farmers deserve higher prices for their produce and exports would help in this direction. Again, there is question of livelihood. Let's ignore the middlemen for a while, and we see that once exports are on, the price eventually trickles down to farmers. Then there are traders and exporters. They are the ones who stick their neck out. And no one talks about them. They source the cotton, liaison with importers and run around to get the good exported. A sudden ban leaves them at the mercy of various government and other agents, depending on what stage of export the goods were. Something next to the ship, without a let export order from customs, is stuck. It takes time to recover if the trader is small. A very nice summary of cotton/sugar issue and the importance of having timely data for policy making can be found at Nidhi Nath Srinivas' article from ET. This blog addresses a slightly different issue. I am trying to find out if we have a trade policy goal at country level which is beyond and above the self interests of various lobbies and ministries. I don't consider doubling the exports, gaining x% of world market and so on as policy goals, they can be indicators of success, not policy-intent. I am talking of something like a goal of welfare maximization though trade, which might include employment, industrialization, livelihood, profit maximization of firms and various other factors of interest as parameters and variables. It must be aligned to overall strategy of national development. And that makes me wonder, do we even have a CGE model that's used by trade policy makers to simulate the policy effects? If the answer is no, where are we going? Shall we use common sense in the lack of it? If yes, whose common sense? The ideal way to resolve the cotton issue, or any such issue, is to simulate the effect of cotton prices on textile industry and present the numbers to the ministers. It should include employment effects too. The effect of price on future agriculture production should also be simulated. Based on these two (I am keeping it simple for the blog), one can take a balanced call and get a broad direction. Finally it has to be a subjective call by the minister. However, the model and simulations would help in arriving at the conclusion in a scientific way. And for all this, you need data, and you need a dedicated team in commerce ministry that maintains the model. If such a team indeed exists, it is hidden from public for some unknown reasons. I couldn't get any whiff of it anywhere on the internet. In that regard, I must appreciate RBI for it's efforts and the models that they maintain for use in monetary policy making. And they are quite public. As the prices fluctuate upwards and such pressures start coming in for various commodities at various times, one cannot go on with such inter-ministerial spats and prime minister helping them to compromise and agree. One has to set a high level trade policy goal(s), and establish a process of analyzing things scientifically. The goals can be tweaked based on the contingencies, but the process to arrive at the conclusions, based on the policy goals, must be kept scientific, in the light of data and simulations. The technology to do that is here, the people are here, but I guess, somewhere, what's lacking is the will. Will the real policy-maker, please stand up? The above is a plot from the world bank data that I downloaded in excel format from here (click on the small link to historical data under prices section). It's a data mine for world commodity price movement analysis. 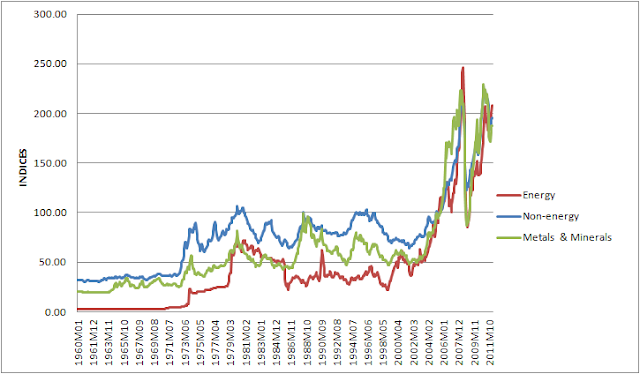 I have plotted the commodity price indices from 1960 to March 2012 on a monthly basis. The data is price adjusted by taking a base of 100 for US dollar for the year 2005. Non energy includes agriculture, food, fertilizers and other raw materials. High and sustained economic growth combined with expansionary macroeconomic policies. Derived from the point above, increased demand from fast growing developing countries such as BRIC, primarily China. This is especially true for energy, metals and minerals. Low capital investment esp in non-energy commodities for past three decades due to lack of returns on investment. If one sees the past thirty years, the price increase was not lucrative enough to invest. Geopolitical issues such as Iran that effects Energy prices. Financial institutions and their derivative instruments. They have entered in a big way into this market. Energy prices and food prices are correlated. It is argued that agriculture being an energy intensive industry gets affected by energy price movements. It is estimated that, globally, agriculture is 4 to 5 times more energy intensive than manufacturing! Bio-fuels, contrary to popular perception, are not a cause. Multiple research studies have shown that their effect has been mostly negligible in the current price rise. However, if the trend continues to divert food to fuels, it might start having an effect. The research studies on speculation in commodities market are inconclusive. The probability of such activities affecting long term trends is quite low, but in the short term, they may induce higher price variability by inducing additional volatility. However, the current rally is a sustained one and therefore difficult to attribute to speculative activities. The supply side in this area, globally, is concentrated in few players. Each agriculture commodity is concentrated in the hands of four or five major players and a few small players. The export policies of these countries affects the commodity prices in a significant manner. And when it comes to sensitive commodities countries resort to export bans and prohibitive taxes as a response to global price movements. Agricultural production has suffered from chronic under-investment for several decades in many areas of the world. This is due in part to the low commodity prices of the 1980s and 1990s that discouraged investment. In addition, agricultural production in many developing countries was disrupted by government neglect and under-investment, often in response to policies imposed by international financial institutions that dismantled State support to the agricultural sector. Further damage was wrought by the heavily distorted nature of the international trading system that required many developing countries to open their markets, while continuing to allow developed countries to depress their agricultural prices through massive subsidies. The outcome of this neglect and under-investment has been a lagging supply response and an increased vulnerability of production, notably to the effects of climate change. In recent years, there has been some shocks on supply due to drought in Australia, weather related low yield in Canada, fire in Russia, and so on. This has further put pressure. The demand side issues are pointed out in the commodity price rise factors. They apply to agricultural and raw materials too. Now comes the policy issues. There are countries like ours, where Sugar, Cotton, Onions and such products are very sensitive issues. There are multiple interested parties. How should a policymaker strike a balance. Most of such commodities have an export ban, which is relaxed at times, when the prices fall domestically and the international prices remain high. The farmers and growers would like to gain from international prices rally. Food security issues dictate otherwise. Also, there is a conflict among users and producers of raw materials. E.g. textile mill owners would like to have cotton cheap by banning exports and so on. As the commodity prices were almost stagnant for decades, the issue was dormant. Now that the commodities are on rise, big time, the pressure is going to rise in coming years. Balancing the interests would be challenging for the policy makers. I would talk about this issue in part 2 of this post. I had blogged about the Fertilizer procurement and import issues (especially for Potash and Phosphate) here. This time I would blog about the international cartel and the game that forced some policy relaxation in this area. I shall be talking about Phosphate (P which comes from Di Ammonium Phosphate or DAP) and Potash (K which comes from Murate of Potash, shortly called MOP). These two are major nutrients apart from Nitrogen (Urea, obtained from natural gas/Naptha). India imports 90% of its requirements in the phosphates (P) and 100% of potash (K). 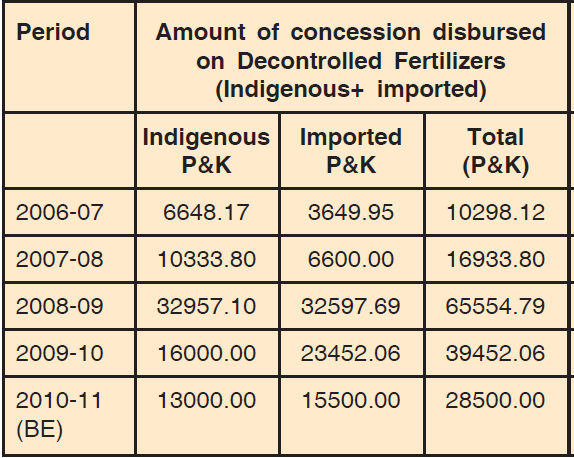 P & K are now decontrolled and are covered under open general license and anyone can import them, unlike urea, which is still under control and can only be procured by canalized agencies with government licences. The amount of subsidy given is calculated by the formula; Subsidy = Actual cost - MRP. Earlier, the MRP for P&K was controlled and fixed by the government and hence the subsidy was a function of actual cost. The actual cost in turn was determined by international prices. Subsidy bills varied every year based on what the international prices were. And that's where the trouble began. In the year 2007-2008. Now, Cartels are not a very viable option theoretically. The reward to renege from the cartel is extremely lucrative for an individual member, and generally that leads to break-up of cartels. Once a strong member gets out, the cartel becomes meaningless. You can find more about unsustainability of cartels here. Internationally Canpotex is the main 'alleged' cartel in the field of Potash (MOP). They cover the major producers of potash from Canada and hold a substantial share from organizations from Russia and Belarus and more or less cover all the producers in the world. So, this was a close cartel which was difficult to break. In the field of phosphate too, due to similar nature of ore availability, there was an international cartel operating. China is a fellow consumer like India, however, they are slightly luckier due to some indigenous availability. Brazil is one more nation like us. Now, India is number 1 importer of Potash at 6 million tonnes. The case is similar in the phosphate, we being a big enough buyer to affect international price movements at around 25% of total world imports. 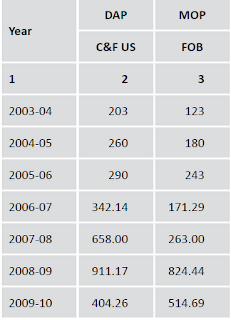 The movement of international prices of MOP and DAP in dollars per tonne is given below. One can see that there is a sharp rise from the year 2006-07 to 208-09 and then a decrease in 2009-10 onward. I will explain the reasons later. 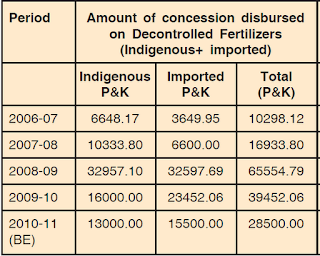 A look at the subsidy bill will show the sharp spike due to the above price shoot up in the imported P&K. The government's total subsidy bill (including Urea), shot up from around 26000 crores in 2006-07 to around 100000 crores in 2008-09. This four fold increase was simply because the cartels decided to play hardball. They knew that irrespective of the price, the demand for P&K in India will remain constant (or increase incrementally) as the MRP in India is constant due to subsidies. They rolled the dice. China resorted to indigenous sources. India tried and failed to break the cartels. Also, India struggled to meet the mounting subsidy bills. That's when people in the Department of Chemicals and Fertilizers came up with solutions, which at other times, would not have been probably accepted. India tweaked the subsidy formula. Now, the MRP was no longer fixed for P&K. The fertilizer companies were allowed to fix/determine it. So that was a major decontrol step. Now the subsidy/tonne for P&K was fixed. So the formula remained same, i.e. Subsidy = Actual cost - MRP. However, now the actual cost fluctuations were passed on to the MRP, the difference being a constant, which the Govt determined from year to year. In effect, what happened was that the demand curve was operational now. The price increase was passed on the consumers, with a subsidy effect. However, as the downward sloping demand curve dictates, the quantity demanded came down with price rise, drastically in this case. When the demand came down, it affected the international cartels who were forced to cut the prices as can be seen from 2009-10 onward. The market forces were now operational. And the subsidy bill came down significantly for Govt of India. The catch was, what was the effect of this decreased consumption on crop output? Did the production of crops go down? If yes, then this is not acceptable solution due to food security issues. I got the answer to this from a senior official recently while walking through the narrow corridors of Shastri Bhawan. Apparently, P&K remains in the soil for around 2 to 3 years. So once applied, you can survive on the residual in the soil for coming couple of years. That gave the courage to the government to take the risk and teach the cartels a lesson. I found the entire episode brilliant. Hence the blog. There is an interesting report on "Measures to stimulate growth in IT/ITES and Electronic hardware industry". I tried to find out if they have come up with some innovative measures to stimulate the electronic hardware industry development in India. We have been struggling in this area for quite some time. Our semiconductor industry is still in its infancy, despite efforts by the Govt (through semiconductor policy and such), with not much hope of matching China/Taiwan or other East Asian economies in near future. Turn around the laptop or computer you are reading this blog on, and chances are, the hardware has come from China, Taiwan or one of the East Asian countries and not from India. Some random firmware or a bit of software on the computer might be from India, but that's more or less it. The report makes all the right noises about the problems in page 57, and comes up with recommendations from page 61 onwards. They cover both electronics hardware and semiconductors thoroughly. Semiconductors are given special attention and separately dealt in later pages of the report. The recommendations are wide ranging, covering tax rationalization to special incentives, investment boost, infrastructure and R&D facility developments and so on. The standard model of comparison is China, Taiwan and the emerging countries in this area like Vietnam and Malaysia. Electronics hardware (including semiconductors) industry mass produces the outputs at global level. I am not talking of the latest cutting-edge research products, but the general chips and electronic hardware we see commonly, like home appliances, computers, industrial control systems and machines. The returns to scale is important here. If I assume that the manufacturer somehow overcomes the investment barrier through lots of policy help from Govt. even then, he will face the problem of operating at a point where his economies of scale would not work in his favor. See the figure below. The average cost of the production for an increasing returns to scale industry will operate in the area where the curve is coming down. Our manufacturer will be operating to produce a lower quantity at Q, with an average cost of C, whereas the competitor who is operating at Q2, can manufacture the product at cost C1 which is much cheaper than C. So he will be having a competitive advantage. The inquisitive mind might ask what if we do heavy investment and start mass producing at level Q2. The problem is, this approach will not work. There are other effects, such as learning effects, maturing of manufacturing technology and such, which also play a role to get there. Also, development of such a scale needs an entire cluster development of required ecosystem. The backward and forward integration is also important to get such scales. So, it is not feasible to just pour in huge money and get the scales. The second question is as to how countries like Vietnam and Malaysia are coming up. They came up in recent years. This is mostly due to Chinese industries, who are already enjoying huge economies of scale, using China plus one policy and spreading the risk to these countries. They are opening their manufacturing units in these countries to take advantage of lower labor costs relative to China. So, it's more of an extension of already existing scale economy. India has been unfortunate in this area too. Not much has come in into India in this area. To start, we can do all that is recommended in the report. It might not help, but it will surely not harm. Also, we should be very clear about protecting and nurturing sunrise industries. To start, we should identify the next big things and start making right policies. Green technology might be one. Solar and renewable energy might be another area. We should be the pioneers. Even if we are not the pioneers, we should be ready to adapt once the product lifecycle enters a stage where the manufacturing technology is ready for adoption. Also, a trade barrier in such cases might help. Let our industry survive, we can think of free trade later. There is some confusion regarding quotas, tariffs and their application among general public and even among some people who claim to know things. However, the attempt to explain a concept of this nature in a blog is fraught with risk of being misunderstood. I cannot use mathematics and graphs in a general blog, and so I would try and connect them through some links to webpages. For preliminary understanding of quotas and tariffs one can follow the wiki. It is generally assumed that tariffs are better than quotas. And most of this misconception comes from the WTO rules, that somehow make it sound as if tariffs are better than quotas. Anything that reads 'quota' is abhorred in general and tarrification is considered the starting point of trade liberalization. If one reads elementary economics, one would see that quotas are more trade restrictive than tariffs. And the person reasons, along with WTO, that due to the trade restrictive nature of quotas, they shouldn't be used, unless there is an emergency of monetary or other sorts like injury to industry etc. For some reason, the elementary texts stop at that. If you go a little further, you will bump into Bhagwati's paper where he argues about tariffs and quotas being one and the same, producing same effects, under certain assumptions like free market and perfect competition. The welfare effect gains/losses can also be made same given the quotas are judiciously auctioned or sold (otherwise the quota benefits accrue to the seller or importer or the quota-issuing-bribe-taking bureaucrats). So, it is not that import quotas are bad as such, just that they appear to be more trade restrictive. However, there is one particular condition, which is more true in case of developing countries, where quotas appear to serve the purpose better than tariffs. Under 'lack of complete information' about the market supply and demand curves, quotas would work better if the government wants to control imports for some reason (to protect an industry, to nurture a new industry, or to protect an interest group etc). Lack of complete information might pertain to the lack of information regarding the supply curve or the demand curve. This means, in turn, that the government cannot be sure of the effects of tariffs. This is because the supply conditions is not a curve but a band now. It can be shown that (Weitzman, 1977, I am unable to locate the paper on web), the effect of tariff can vary from a small import to a huge deluge and the magnitude cannot be predicted. However, quotas under such case will ensure that the imports are under control. The price now is not a constant number like earlier, but varies in a band. However, that doesn't affect the goal of controlling imports. If the goal of government is to control imports to some certain degree, tariff is a blunt instrument unless all information and data regarding the economy and the industry is available in precise form. Given India's situation and the quality of data that's available, I am sure we are in an uncertain zone. Correct me if I am wrong. You just cannot predict the level of imports with any tariff in place. Too much of tariff will kill all imports, and too small a tariff will flood the market. The exact tariff cannot be easily determined, unless one is ready to do a trial and error, which again, is not scientific way of doing things. So it makes a lot of sense for Indian government to keep the quota option open in case it wants to control an import in a precise way. On a side note, IIIA of FTDR Act of India, introduced through a notification in 2010 allows GoI to impose quotas under certain conditions. Someone told me that this can be challenged at WTO, which I doubt, given the wordings of this chapter. Balance of Trade - Is it alarming? India's merchandise trade deficit for the period Apr 2011 - Feb 2012 is around 167 Billion USD. The figure for the previous corresponding period was 115 Billion USD. So, we are looking at an annual deficit of around 180 billion USD once the March data comes in. Merchandise trade is only a part of the total Balance of Payment. Services and other invisibles have made up for the merchandise deficit for many years now. Good capital inflows have added to the reserves. So there was no reason to worry about negative balance of trade. Our Balance of Payments position has been good for many years now, despite a negative Balance of Trade. There is no hard and fast rule that determines what is a good trade surplus or deficit in international trade. There are indicators such as trade deficit to GDP ratios that are used as a rule of thumb, but then, they are just that. There is also a rough check where one can see if the merchandise trade deficit is adversely affecting the current account balance and if the effect is severe. I personally like this indicator when taken as a proportion of GDP. And the pictures doesn't seem very rosy this year. 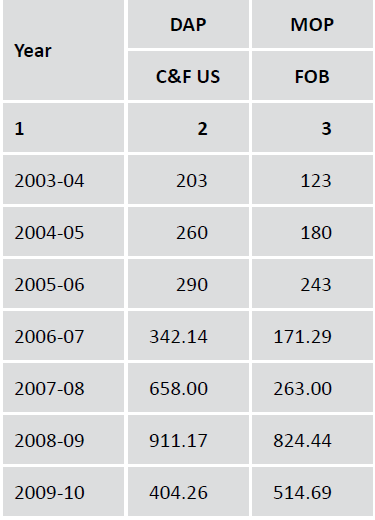 One can see this link (table 6.2), to have an idea of progressively deteriorating Current account deficit to GDP ratio. The CAD (current account deficit) to GDP ratio at market prices has increased from 1 % in 2006 to around 3.8% in 2012. The trade balance continued to deteriorate whereas the invisibles (including services) remained more or less constant as a proportion to GDP. So, the slippage has started. The capital accounts are still holding out the front and hence the overall BoP looks good, but then, if the current account goes the way it is going now, it won't take time before even the capital accounts fails to hold up. Particularly worrisome is the recent upswing in the way imports have grown. On a side note, Wikipedia maintains a ranking of countries based on current account balance. And we are in good company. Our estimated current account deficit, at around 62 billion USD, is almost the same as Brazil, Canada, UK, France, Turkey etc, all of them, without any alarm. At the same time, we also have Italy, Spain, Portugal too hovering nearby. And the biggest name, at the bottom, is the US, but then, it's a different story and hence ignored. India’s Exports during February, 2012 were valued at US$ 24618.08 million (Rs.121039.96 crore) which was 4.28 per cent higher in Dollar terms (12.84 per cent higher in Rupee terms) than the level of US$ 23608.36 million (Rs. 107266.46) during February, 2011. Cumulative value of exports for the period April-February 2011 -12 was US$ 267409.89 million (Rs. 1274839.70 crore) as against US$ 220241.12 million (Rs.1003784.83 crore) registering a growth of 21.42 per cent in Dollar terms and 27.00 per cent in Rupee terms over the same period last year. India’s Imports during February, 2012 were valued at US$ 39781.68 million (Rs.195595.00 crore) representing a growth of 20.65 per cent in Dollar terms (30.56 per cent in Rupee terms) over the level of imports valued at US$ 32973.40 million ( Rs. 149817.29 crore) in February, 2011. Cumulative value of imports for the period April-February, 2011-12 was US$ 434159.81 million (Rs.2069642.80 crore) as against US$ 335502.15 million (Rs. 1529295.07 crore) registering a growth of 29.41 per cent in Dollar terms and 35.33 per cent in Rupee terms over the same period last year.